Need to find a pet friendly hotel in Walnut Creek, California? Click the Pet Friendly Accommodations Button below! 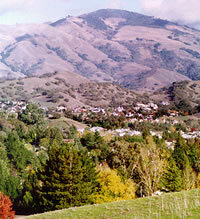 Walnut Creek is a picturesque city set among rolling hills nestled at the base of majestic Mt. Diablo, a great place for hiking with your pet. Just minutes to the west is bustling San Francisco, and less than an hour north are some of the world's fines wine producing regions such as Napa, Sonoma and Alexander Valley. The beach cities of Monterey and Carmel-by-the-Sea as well as the snow-capped mountains surrounding spectacular Lake Tahoe, are all within easy driving distance. It's easy to find pet friendly hotels in Walnut Creek with PetTravel.com. Just click the SEARCH button above for a list of pet friendly hotels, motels, bed and breakfasts, small inns, and vacation rentals in Walnut Creek. If we have information for other pet friendly services in Walnut Creek, a second search button will appear that will include pet friendly beaches, parks, and other fun things to do with your pet. We welcome your emails regarding pet friendly services in your town. Just send an email to info@pettravel.com and we will add them to our database. Come back often as we are always adding new and exciting places for you to visit with your pet. We even offer pet sitters in selected cities who will "petsit" your best friend while you go out to dinner in Walnut Creek.